Project A1 develops data analysis methods for embedded systems. Learning methods are to consume resources minimally so that they can be executed by embedded systems. A1 contributes to these overall goals by developing the theoretical basis of machine learning under resource constraints. In particular, it investigates machine learning models that formalise implicit functional relations within the data. More precisely, a model, e.g., from the class of linear models, exponential families, decision trees, or convolutional networks, specifies the general formal basis of any machine learning method. It determines implicitly what is learned (e.g., classifier, probability density, clustering model), and from what it is learned (e.g., real-valued vectors, categorical data, count data). Instances of a particular model are assessed by a quality measure (e.g., root mean square error, F β -score, correct classification rate, or the likelihood). In A1, we extend this notion of quality by adding simplicity of model representation and simplicity of inference, where simplicity is relative to the underlying hardware architecture. Thus, the quality of a model may comprise its memory consumption, numerical precision, parameter integrality, or approximability. Since learning itself is often expressed by one or more optimisation problems, resource constraints are added to the quality measure via regularisation. Several algorithms exist that can find (approximate) solutions to optimisation problems. Finally, the algorithms are executed on a specific hardware platform. Each of these layers, i.e., platforms, algorithms, models, is studied in the research centre. Project A3 starts with the execution on a certain platform, project A2 moves on to algorithms, and project A1 investigates the models of learning. There is a plentitude of heuristics that algorithmically save resources. However, heuristics most often come without guarantees. In the A1 project, we specify restrictions at the model level and analyse the impact of the restriction on the quality. Moreover, a model of learning with proven guarantees makes explicit the link from the restrictions of the model to those of constrained hardware. It is a long way to achieve such models with guarantees. For the class of learning within the exponential family, we succeeded in developing spatiotemporal random fields, integer Markov random fields, and a novel quadrature based on first principles, each focusing on specific constraints. Proven properties of the novel models conclude the basic research on exponential families. At the same time, applications in other projects have already shown their practical usefulness. 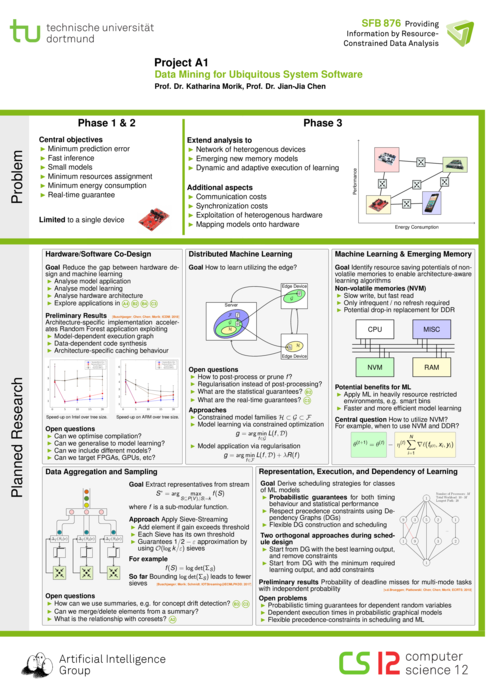 For top-down decision trees, the journey has just begun, and first publications show the potential of linking tree models of learning to FPGAs. Lochmann/etal/2019a Lochmann, Alexander and Schirmeier, Horst and Borghorst, Hendrik and Spinczyk, Olaf. LockDoc: Trace-Based Analysis of Locking in the Linux Kernel. In Proceedings of the 14th ACM SIGOPS/EuroSys European Conference on Computer Systems (EuroSys '19), 2019. Buschjaeger/2018a Buschjäger, Sebastian and Chen, Kuan-Hsun and Chen, Jian-Jia, Morik, Katharina. Realization of Random Forest for Real-Time Evaluation through Tree Framing. In The IEEE International Conference on Data Mining series (ICDM), 2018. Hoelscher/etal/2018a Hölscher, Nils and Chen, Kuan-Hsun and von der Brüggen, Georg and Chen, Jian-Jia. Examining and Supporting Multi-Tasking in EV3OSEK. In 14th annual workshop on Operating Systems Platforms for Embedded Real-Time applications, OSPERT 2018, July 3, 2018. Barcelona, Spain, 2018. Piatkowski/Morik/2018a Piatkowski, Nico and Morik, Katharina. Fast Stochastic Quadrature for Approximate Maximum-Likelihood Estimation. In Proceedings of the Thirty-Fourth Conference on Uncertainty in Artificial Intelligence, UAI 2018, California, USA, August 6-10, 2018, 2018. Sliwa/etal/2018e Benjamin Sliwa and Nico Piatkowski and Marcus Haferkamp and Dennis Dorn and Christian Wietfeld. Leveraging the channel as a sensor: Real-time vehicle classification using multidimensional radio-fingerprinting. In 2018 IEEE 21st International Conference on Intelligent Transportation Systems (ITSC), Maui, Hawaii, USA, 2018. Lochmann/etal/2017a Lochmann, Alexander and Bruckner, Fabian and Spinczyk, Olaf. Reproducible Load Tests for Android Systems with Trace-based Benchmarks. In Proceedings of the 8th ACM/SPEC on International Conference on Performance Engineering Companion, pages 73--76, New York, NY, USA, ACM Press, 2017. Buschjaeger/2016b Sebastian Buschjäger. Online Gauß-Prozesse zur Regression auf FPGAs. No. 1, TU Dortmund, 2016. Piatkowski/Morik/2016a Piatkowski, Nico and Morik, Katharina. Stochastic Discrete Clenshaw-Curtis Quadrature. In Proceedings of the 33rd International Conference on Machine Learning, ICML 2016, New York, USA, 19-24 June 2016, JMLR.org, 2016. Piatkowski/Schnitzler/2016a Piatkowski, Nico and Schnitzler, Fran\ccois. Compressible Reparametrization of Time-Variant Linear Dynamical Systems. In Solving Large Scale Learning Tasks. Challenges and Algorithms - Essays Dedicated to Katharina Morik on the Occasion of Her 60th Birthday, pages 234--250, 2016. Poelitz/etal/2016a Poelitz, Christian and Duivesteijn, Wouter and Morik, Katharina. Interpretable Domain Adaptation via Optimization over the Stiefel Manifold. In Machine Learning, Vol. 104, No. 2-3, pages 315-336, 2016. Stolpe/etal/2016a Stolpe, Marco and Blom, Hendrik and Morik, Katharina. Sustainable Industrial Processes by Embedded Real-Time Quality Prediction. In Kersting, Kristian and L\"assig, J\"org and Morik, Katharina (editors), Computational Sustainability, pages 201--243, Springer, 2016. Downar/Duivesteijn/2015a Downar, Lennart and Duivesteijn, Wouter. Exceptionally Monotone Models - the Rank Correlation Model Class for Exceptional Model Mining. In Data Mining (ICDM), 2015 IEEE International Conference on, pages 111-120, IEEE, IEEE Computer Society, 2015. Streicher/etal/2015a Streicher, Jochen and Lochmann, Alexander and Spinczyk, Olaf. 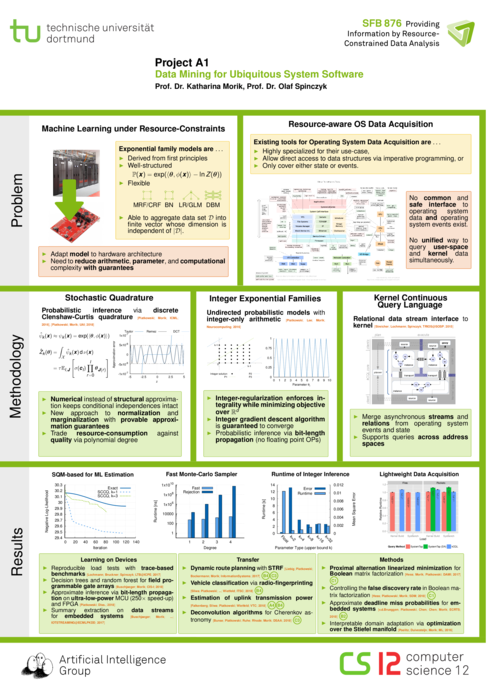 kCQL: Declarative Stream-based Acquisition and Processing of Diagnostic OS Data. In Proceedings of the Conference on Timely Results in Operating Systems (TRIOS), 2015. Bockermann/2014a Christian Bockermann. A Visual Programming Approach to Big Data Analytics. In Proc. HCI International 2014, 2014. Bockermann/2014b Christian Bockermann. A Survey of the Stream Processing Landscape. No. 6, TU Dortmund University, 2014. Piatkowski/etal/2015b Piatkowski, Nico and Streicher, Jochen and Olaf, Spinczyk and Morik, Katharina. Open Smartphone Data for Structured Mobility and Utilization Analysis in Ubiquitous Systems. In Atzmueller, Martin and Chin, Alvin and Scholz, Christoph and Trattner, Christoph (editors), Mining, Modeling and Recommending Things in Social Media, Vol. 8940, pages 116 -- 130, Springer, 2014. Piatkowski/Morik/2014a Piatkowski, Nico and Morik, Katharina. Towards an Integer Approximation of Undirected Graphical Models. In Proceedings of the 16th LWA Workshops: KDML, IR and FGWM, Aachen, Germany, September 8-10, 2014., pages 123--124, 2014. Streicher/2014a Jochen Streicher. Data Modeling of Ubiquitous System Software. No. 7, TU Dortmund University, 2014.
streicher/etal/2013a Streicher, Jochen and Nassour, Orwa and Spinczyk, Olaf. System Support for Privacy-preserving and Energy-efficient Data Gathering in the Global Smartphone Network -- Opportunities and Challenges. In Proceedings of the 3rd International Conference on Pervasive and Embedded Computing and Communication Systems (PECCS '13), pages 80--85, SciTePress, 2013. Streicher/etal/2013b Streicher, Jochen and Piatkowski, Nico and Morik, Katharina and Spinczyk, Olaf. Open Smartphone Data for Mobility and Utilization Analysis in Ubiquitous Environments. In Atzmüller, Martin and Scholz, Christoph (editors), Proceedings of the 4th International Workshop on Mining Ubiquitous and Social Environments (MUSE), 2013. Morik/etal/2011a Morik, Katharina and Kaspari, Andreas and Wurst, Michael and Skirzynski, Marcin. Multi-Objective Frequent Termset Clustering. In Knowledge and Information Systems, Vol. 30, No. 3, pages 715-738, 2012. Piatkowski/2012a Piatkowski, Nico. iST-MRF: Interactive Spatio-Temporal Probabilistic Models for Sensor Networks. In International Workshop at ECML PKDD 2012 on Instant Interactive Data Mining (IID), 2012. Fricke/etal/2011a Fricke, Peter and Jungermann, Felix and Morik, Katharina and Piatkowski, Nico and Spinczyk, Olaf and Stolpe, Marco and Streicher, Jochen. Towards Adjusting Mobile Devices To User's Behaviour. In Atzmueller, Martin and Hotho, Andreas and Strohmaier, Markus and Chin, Alvin (editors), Analysis of Social Media and Ubiquitous Data, Vol. 6904, pages 99--118, Berlin, Heidelberg, Springer, 2011. Jungermann/2011a Jungermann, Felix. Handling Tree-Structured Values in RapidMiner. In Proceedings of the 2nd RapidMiner Community Meeting and Conference (RCOMM 2011), pages 151 -- 162, 2011. Jungermann/2011b Jungermann, Felix. Tree Kernel Usage in Naive Bayes Classifiers. In Proceedings of the LWA 2011, 2011. Jungermann/2011c Jungermann, Felix. Documentation of the Information Extraction Plugin for RapidMiner. 2011. Piatkowski/2011b Piatkowski, Nico. Probabilistic Graphical Models in RapidMiner. No. 2, TU Dortmund University, 2011. Piatkowski/2011c Piatkowski, Nico. Parallel Algorithms for GPU Accelerated Probabilistic Inference. In International Workshop on Big Learning, Neural Information Processing Systems (NIPS), 2011. Piatkowski/Morik/2011a Piatkowski, Nico and Morik, Katharina. Parallel Inference on Structured Data with CRFs on GPUs. In International Workshop at ECML PKDD on Collective Learning and Inference on Structured Data (COLISD), Athens, Greece, 2011. Piatkowski/Morik/2011b Piatkowski, Nico and Morik, Katharina. Parallel Loopy Belief Propagation in Conditional Random Fields. In KDML Workshop of the LWA2011, Magdeburg, Germany, 2011. Streicher/Spinczyk/2011a Streicher, Jochen and Spinczyk, Olaf. Energy-Efficient GPS-Based Positioning in the Android Operating System. No. 3, TU Dortmund University, 2011. Piatkowski/2018a Piatkowski, Nico. Exponential Families on Resource-Constrained Systems. TU Dortmund University, Dortmund, 2018. Poelitz/2016d Poelitz, Christian. Automatic methods to extract latent meanings in large text corpora. 2016. Jungermann/2012a Jungermann, Felix. About the Exploration of Data Mining Techniques using Structured Features for Information Extraction. Technische Universität Dortmund, 2012. Hildebrandt/2018a Hildebrandt, Hendrik. Deep Reinforcement Learning zur Minderung von Verspätungen im ÖPNV. TU Dortmund, 2018. Pang/2018a Pang, Weihan. A Machine Learning Approach for Aspect-based Sentiment Analysis on Social Media. TU Dortmund, 2018. Kilian/2017a Kilian, Phillip. Visualisierung von Embeddings zur Analyse großer Dokumenten-Kollektionen. 2017. Peter/2017a Peter, Sebastian. Multi-modal Route Planning with Dynamic Public Transport Delays. TU Dortmund, 2017. Sitta/2017a Sitta, Andreas. Entdecken von Themen und Communitys in Online-Foren. 2017. Buschjaeger/2016a Buschjäger, Sebastian. Online Gauß-Prozesse zur Regression auf FPGAs. TU Dortmund, 2016. Heppe/2016a Heppe, Lukas. ÖPNV Verspätungsvorhersage mit probabilistischen graphischen Modellen. 2016. Vishnyakova/2016a Vishnyakova, Liudmila. Untersuchung von Poisson- und Multinomialverteilungsbasierten Modellen für die Analyse von Verkehrsdaten. 2016. Ahmels/2015a Ahmels, Eike. Kernmengenbasiertes Clustering von Datenströmen auf Android- basierten Smartphones. TU Dortmund, 2015. Langenberg/2015a Langenberg, Jonas. Erkennung ungewöhnlicher Textbelege in großen Textkorpora mittels minimum enclosing Balls. 2015. Risse/2015a Sarah Risse. Untersuchung latenter Strukturen im Parameterraum maschineller Lernverfahren. TU Dortmund, Computer Science 8, 2015. Schendekehl/2015a Schendekehl, Tim. Implementierung von Konfidenz-basierten Aktivenlern-Methoden in RapidMiner. TU Dortmund, 2015. Asmi/2014a Mohamed Asmi. Nutzungsmuster in Datenströmen Android-basierter Smartphones. TU Dortmund, 2014. Kloeckner/2013a Tim Klöckner. Betriebssystemseitige Energieoptimierung mobiler Datenkommunikation durch Paketbündelung. TU Dortmund, CS12, 2013. Masarwa/2013a Aiser Masarwa. Untersuchung der Energieeffizienz verschiedener Methoden der Datenerhebung auf Android-Smartphones. TU Dortmund, CS12, 2013. Matuschek/2013a Matuschek, Christian. Symbolisierung und Clustering von Zeitreihen als neue Operatoren im ValueSeries Plugin von Rapidminer. 2013. Skirzynski/2013a Skirzynski, Adrian. Aggregation häufiger Mengen in Datenströmen. TU Dortmund, 2013. Spain/2013a Spain, David. A Survey on Subspace Clustering. TU Dortmund, 2013. Kokott/2012a Kokott, Markus. Verkehrsvorhersage unter Verwendung von Methoden des maschinellen Lernens. 2012. Skirzynski/2012a Skirzynski, Marcin. Subspace-Clustering mit parallelen häufigen Mengen. TU Dortmund, LS 8, 2012. Piatkowski/2011a Piatkowski, Nico. Parallele Implementierung von Conditional Random Fields unter Verwendung von General-Purpose computation on Graphics Processing Units. Technische Universität Dortmund, 2011. Lokuciejewski/etal/2010a Lokuciejewski, Paul and Stolpe, Marco and Morik, Katharina and Marwedel, Peter. Automatic Selection of Machine Learning Models for WCET-aware Compiler Heuristic Generation. In Proceedings of the 4th Workshop on Statistical and Machine Learning Approaches to ARchitecture and compilaTion (SMART), 2010. Morik/etal/2010c Morik, Katharina and Jungermann, Felix and Piatkowski, Nico and Engel,Michael. Enhancing Ubiquitous Systems Through System Call Mining. In Large-scale Analytics for Complex Instrumented Systems (LACIS), Workshop at ICDM 2010, 2010. Tartler/etal/2010a Reinhard Tartler and Daniel Lohmann and Fabian Scheler and Olaf Spinczyk. AspectC++: An Integrated Approach for Static and Dynamic Adaptation of System Software. In Knowledge-Based Systems, Vol. In press, Corrected Proof, 2010. Bockermann/etal/2009a Bockermann, Christian and Apel, Martin and Meier, Michael. Learning SQL for Database Intrusion Detection Using Context-Sensitive Modelling. In Proceedings of the 6th Detection of Intrusions and Malware, and Vulnerability Assessment, pages 196 -- 205, Springer, 2009. Mierswa/Morik/2008a Mierswa, Ingo and Morik, Katharina. About the Non-Convex Optimization Problem Induced by Non-positive Semidefinite Kernel Learning. In Advances in Data Analysis and Classification, Vol. 2, No. 3, pages 241--258, 2008. Jungermann/2007a Jungermann, Felix. Named entity recognition without domain-knowledge using conditional random fields. In Workshop Notes of the Machine Learning for Natural Language Processing Workshop, pages 16 -- 17, van Someren, Marten and Katrenko, Sophia and Adriaans Pieter, 2007.